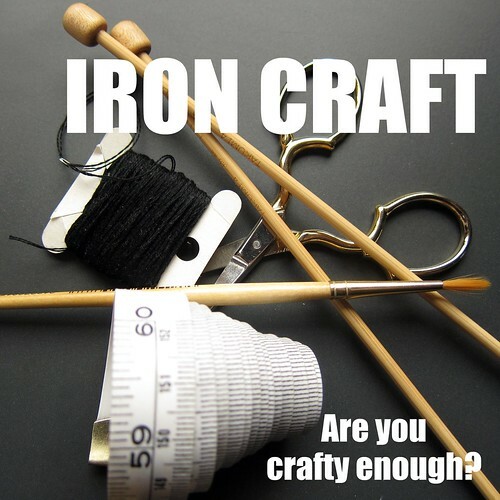 I interrupt this Handmade 365 Project to let you all in on next year’s project, Iron Craft. Susi, from Craftroom, & I so enjoyed the weekly challenges of Project Project Runway this year that we decided we wanted to do a whole year of crafty challenges. So, we created Iron Craft. Each week one of us will set a new challenge. The following week we’ll all reveal how we interpreted that challenge. Some weeks the challenges may be very specific, while others weeks might just be based about a theme. We’d love to have join in the fun (if we get more people involved there might even be prizes from time to time). Worried you can’t do a challenge every week? That’s ok, we don’t expect everyone to do every challenge but it’ll be fun to see how many we can do! Visit the Iron Craft blog to get all the details. The first challenge will be announced on Thursday, December 30th. Hummm. I may be into this. Any more details? Lori – Most of the details are on the Iron Craft blog http://theironcraft.blogspot.com. Each week's challenge will be a surprise. Is there something specific you were wondering about? I've joined the flikr group. I hope to be able to participate, but that will depend on how difficult the challenges are and whether I'll have the time. I do love this idea and I can't wait to see the first challenge!! !